The R-PLEX Human CRP Antibody Set includes a matched capture and detection antibody pair and calibrator for the quick and easy measurement of CRP in biological samples. R-PLEX products leverage MSD’s electrochemiluminescence technology for better sensitivity and a larger dynamic range than traditional ELISAs. R-PLEX matched antibody sets enable the development of singleplex and multiplex immunoassays. Individual assays may be developed using MSD avidin- or streptavidin-coated plates. Custom multiplex assays with any combination of R-PLEX analytes, as well as R-PLEX plus U-PLEX analytes can be developed on U-PLEX MULTI-SPOT plates. To learn more about the advantages of R-PLEX products click here. 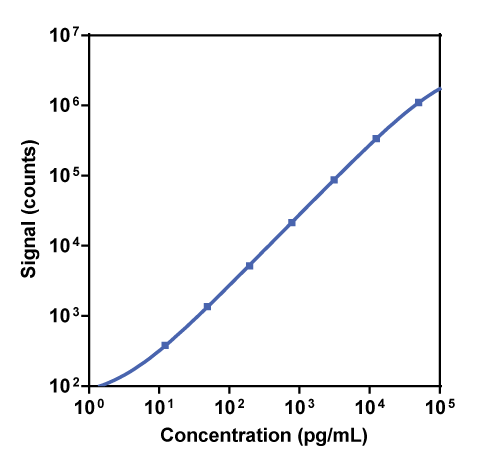 Calibration curve for the R-PLEX Human CRP Antibody Set was assessed and representative data are presented below. Description - C-Reactive Protein (CRP, pentraxin 1, PTX1) is a member of the pentraxin family of proteins and is produced by the liver in response to IL-6. C-reactive protein is an acute-phase protein. Levels of CRP in the blood rise significantly in response to inflammation and other long-term diseases such as cancer, arthritis, infections, and diseases of the cardiovascular and immune systems, making it relevant for research of these conditions. It activates the complement system through C1q and initiates phagocytosis of bacteria and cells undergoing apoptosis.